It’s the first of April, but I’m not fooling when I tell you there is a great new release from Mitten State Stamps/Technique Junkies! This month, we are releasing two new floral stamps, Lily of the Valley and Lilacs! I paired both of these stamps with two other sets from this month’s Technique Junkies release, Anniversary Sentiments and Wedding Wishes. This stamp was created from a drawing I did from lily of the valley that is growing under my neighbor’s hedge. I took a bunch of photos and made this drawing, which I then turned into a stamp! For this card, I stamped with Versafine Onyx ink and painted with Daniel Smith watercolors. I stamped the greeting on Bazzill Card Shoppe Licorice Twist card stock with Versamark ink then embossed with white EP. I created this card by stamping on Strathmore Bristol with Versafine Onyx Black then coloring on top with Posca paint pens, which I borrowed from my daughter. I had been wanting to try them for a while. They are a lot like tempera paint that you might have used in elementary school in that they are very matte when they dry and very, very opaque. So once I painted on top of my original stamping, I popped the piece back into my MISTI and stamped on top again. Up until that point, I thought it was a hot mess, but it was amazing how good it looked once I did that! You really MUST heat set the second stamping of Versafine Onyx Black or it just takes forever to dry. I love the painterly look I achieved, but you can also get a very even flat look with single colors rather than trying to mix them on the paper like I did here. The darker colors tend to need more coats to get even coverage. I love both of these cards! I could say these are the last floral stamps for the year, but that WOULD be fooling…there are more to come! 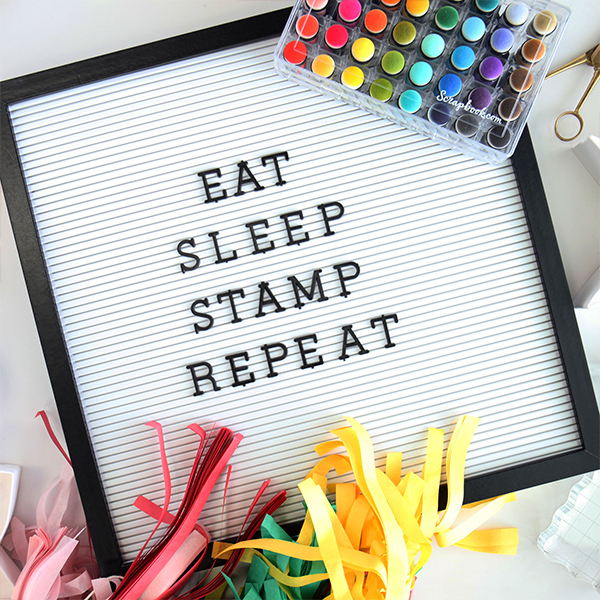 As per usual, the new release is on sale through March 8th, and this month, you will get a free stamp with a $30 purchase! And…. Don’t forget to get the additional discount with my code, both on the new release and older items. Here are links for all of the new release. Janine Tinklenberg <—-You are here. Love your new stamp designs! Beautiful cards. You are such a talented artist and I really love your stamps. Awesome job colouring. I love your stamps, and this month’s Lily of the Valley is gorgeous. The detail is stunning . Beautiful cards for the release, Janine.